All children are born with amazing capabilities that can awakened and fulfilled through systemized instruction, continual practice, and supportive parents. Teachers at N«Top Academy make their utmost effort to adjust lessons to fit the needs of each student while making learning fun and interactive. Each teacher at N«Top Academy brings vast experience and professional knowledge of their areas of expertise. Often teachers will discuss alternative ideas together and continually learn better practices from each other. 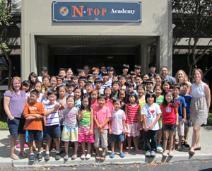 Everyone at N«Top Academy grows.